Eliza May Wells, my second great grandmother, was born in Cambridge, Massachusetts, on August 20, 1839, to Thomas Goodwin Wells and Elizabeth Sewall Willis. She spent her childhood in Merrimack and Walpole, New Hampshire, based on the fact that I find her father and family in Merrimack, Hillsborough, New Hampshire, in the 1840 U.S. Federal Census and I find the family in Walpole, Cheshire, New Hampshire, in the 1850 U.S. Federal Census. Louisa May Alcott was a cousin who spent time with her "Wells cousins in New Hampshire." By 1860, her family had moved to Brookline, Norfolk, Massachusetts and in 1866, she married, as his second wife, a first cousin of her mother, Samuel Sewall Greeley, in either Brookline or Cambridge, Massachusetts. (See their marriage record here.) See Samuel Sewall Greeley's obituary for more about him. Ethel May Greeley (1875 - 1931), my great grandmother. See a photograph of her. Ruth Lyman Greeley (1878 - 1975), who deserves her own blog post one of these days. She was also step-mother to three sons of Samuel and his first wife. 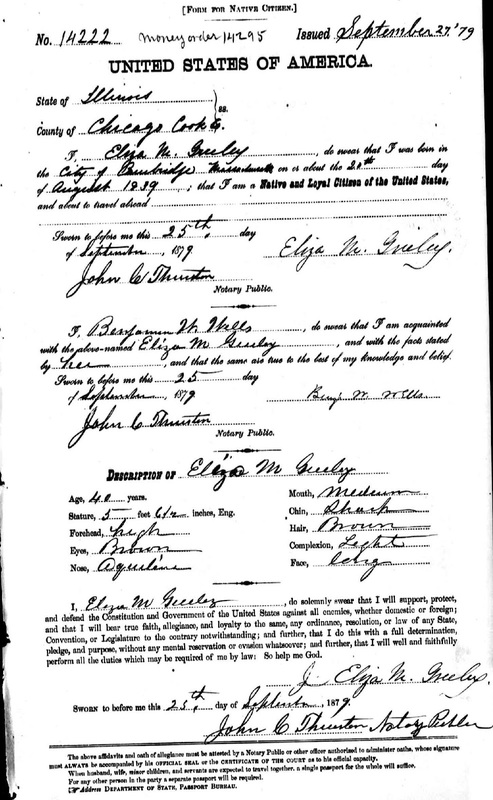 She applied for a passport application on September 25, 1879 in Chicago, Illinois. Her brother Benjamin W. Wells confirmed that she was who she stated she was. Stature, 5 feet 6 1/2 inches, Eng. Later passport applications often require the applicant to indicate where he or she is traveling and why. Unfortunately, I don't know for sure why she was traveling, but I know the ultimate destination was England, because she died in Kensington, London, England, on September 18, 1880. Since I don't have the "World Explorer" Ancestry.com subscription, I can only see the indexed information. There is a brief death notice in the Boston Journal at GenealogyBank.com. GREELEY - In London, England Sept. 18 of consumption, Eliza May Greeley eldest daughter of Elizabeth S. and the late Thomas G. Wells of [Boston? ], and wife of Samuel S. Greeley of Chicago, Ill. There is a gravestone with her name on it in Forest Hills Cemetery, but I have also seen a reference that she was buried in Kensal Green Cemetery in London, so it may just be a memorial stone at Forest Hills Cemetery. Pauline Willis, a first cousin of Eliza May Wells, published Willis records, or, Records of the Willis family of Haverhill, Portland, and Boston in 1908 with St. Vincent's Press of London, and this is a beginning resource for anyone researching the Willis and related families. This can be found in the genealogy section of several libraries, as well as at ancestry.com. My descent from Eliza May Wells > Ethel May Greeley > Lowell Townsend Copeland > My mother > me. Elizabeth, I love reading your posts like these. I see your research and the facts that you've learned about your ancestors. The information is well organized as well. I feel inspired to do the same with the ancestors on my tree in coming posts. Thanks for showing just how 'easily' sharing family history can be. Share what you've discovered in an organized way with supporting documentation. Does it get any more complex? Your posts show that it doesn't. I remember you mentioning that you were related to Louisa May Alcott-- this is so neat! And, in the absence of photos, descriptions like the one you mention are the next best thing.